POSTED: Mon, 12/21/2015 - 17:00 | POSTED BY: Traci C.
Brunch at the Top's beverage menu will feature cocktails, mocktails, or something from the Bloody Mary Bar if you prefer. The meal begins with breakfast pastries and breads including Cranberry Pecan Scones, Tillmook Cheddar Biscuits, and Caramel Apple Monkey Bread. Diners will have a chance to interact with the culinary staff at the on-stage kitchen will enjoying tasting portions of House-Smoked Orange Honey Ham and Deviled Eggs. Salads, sushi, and Greek yogurt parfaits will also be available. The plated entrees for the brunch include Pan-Fried Buttermilk Organic Chicken Cutlet with Haricots Verts, Shrimp and Grits, Poached Lobster Benedict with Two Soft-Poached Eggs and Honey Ham, and a Grilled Iron Flat Steak with Soft Poached Eggs. The brunch desserts are mini desserts, macarons, and chocolate truffles. Brunch at the Top is a prix fixe option with pricing set at $80 for adults and $48 for kids ages 3 to 11. Advance Dining Reservations are open and be booked online or by calling 407-939-3463. 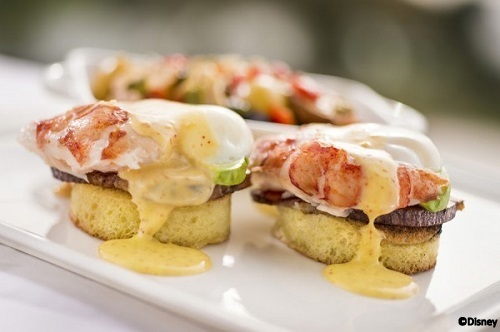 Will you be making plans to enjoy Brunch at the Top at California Grill? Let us know in the comments. I can not wait to try this! When I was a little girl it was always our tradition to have brunch at the Top of the World. This makes my old school Disney heart sing. Will they accept dining Plan? I've never been a fan of the menu unfortunately. Sorry to have to say yuck to that brunch selection as well! lol!